Precious metals sank this week. U.S. Mint American Eagle coin sales this month, meanwhile, are already sharply higher than in May 2015. Precious metals posted sharp losses this week. 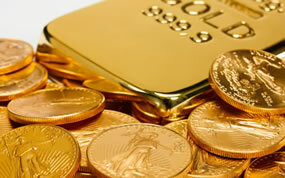 Gold registered its second straight weekly decline and silver extended its losing streak to three weeks in a row. Gold for June delivery edged down $1.90, or 0.2%, to end at $1,252.90 an ounce on the Comex division of the New York Mercantile Exchange. The settlement was the lowest since April 27 when the yellow metal ended at $1,250.40 an ounce. Gold moved slightly higher earlier in the week, and then saw pressure from bearish FOMC minutes released Wednesday afternoon. Prices dropped 1.5% on Thursday, accounting for most of the week’s losses. "In a negative gold environment, gold prices would have been much lower after these Fed comments," Reuters quoted ABN Amro analyst Georgette Boele. "The fact that we are around current levels is a sign that investors are buying on dips and see weakness as an opportunity." Gold futures fell 1.6% this week after retreating 1.7% last week, buy they advanced by more than 5% through the two weeks before then. They are 18.2% higher on the year to date. "This week, Kitco’s online and Twitter surveys received a combined 783 votes. A total of 438 respondents, or 56%, said they were bullish on the week ahead, while 230, or 29%, were bearish. The neutral votes totaled 115, or 15%. Meanwhile, 22 analysts and traders took part in a survey for market professionals. Those looking for further weakness made up the largest chunk of voters, 10, or 45%. Seven, or 32%, look for prices to bounce, while five, or 23%, are neutral." Rising slightly from a one-month low, silver for July delivery added 3.9 cents, or 0.2%, to settle at $16.532 an ounce. On Thursday, silver sank 3.7% and closed at its lowest price since April 18. Silver futures shed 3.5% this week after falling 2.3% last week and 1.6% the week before then. Even with three straight weekly declines, silver still leads in percentage gains this year among precious metals, up 19.8% since ending last year at $13.803 an ounce. July platinum gained $10, or 1%, to $1,023.30 an ounce, but fell 2.7% from a week earlier. Palladium for June delivery added 45 cents, or less than 0.1%, to $558.90 an ounce, diving 5.7% on the week. Palladium’s weekly loss pulled it down into the red for the year. The metal is off 0.6%. Platinum, meanwhile, is 14.6% higher this year. Gold added $7.95, or 0.6%, to $1,254.20 an ounce. Silver declined 4 cents, or 0.2%, to $16.56 an ounce. Platinum added $15, or 1.5%, to $1,025 an ounce. Palladium added $2, or 0.4%, to $567 an ounce. Their weekly loses totaled to 0.9% for gold, 3.1% for silver, 1.6% for platinum and 4.2% for palladium. United States bullion sales posted stronger weekly gains, and so far for this month they are already sharply higher than May 2015 — by more than double for American Gold Eagles and by over 1 million coins for American Silver Eagles. U.S. Mint sales of gold coins advanced 26,000 ounces after rising 12,500 previously. The weekly sales splits include 23,000 ounces in American Gold Eagles compared to 9,000 ounces previously, and 3,000 ounces in American Gold Buffalo compared to 3,500 ounces previously. Silver coin sales moved up by 1,025,000 ounces compared to 972,500 ounces previously. For the first time this month, sales rose for ATB Cumberland Gap Five Ounce Silver Coins. Their total climbed by 11,000 coins to 75,000 coins. The U.S. Mint limited this week’s sales of American Silver Eagles to 1 million coins, matching last week’s allocation level. The Mint’s network of bullion distributors ordered 970,000 of them, which is 2,500 less than a week ago. 2016 Silver Eagles are at a record sales pace of 21,942,500 coins, representing a 35.2% increase over the same stretch of time in record-breaking year 2015. The Mint’s 13 worldwide bullion coin Authorized Purchasers once again & for many weeks in the past two months have not purchased all the weekly allocated ASE bullion coins & left some on the table unsold showing a slowdown in their sales. On another note the World Platinum Investment Council predicts a shortfall of platinum metal at year end. The Austrian Mint issued its first bullion 1-oz platinum Vienna Philharmonic coin earlier this year with very high sales figures. The US Mint’s APE Proof coin usually comes out later in the year & may be up against much higher platinum spot prices by then. Will be interesting to see how many proof platinum eagles are offered for sale by mint in 2016 after their small mintage for the first of the two year set (2015-2016) in 2015 and no bullion ones minted in 2015. Still wonder whether the mint has a “shortage” of the 5 oz blanks for the ATB or if there really is a lack of interest by the AP’s and their customers. There is no shortage of 5-oz silver planchets. The Mint has both the Shawnee & Cumberland bullion & collector versions in stock. APs & their customers just haven’t ordered any of these bullion coins in May except for one day last week. Dealers are dumping their unsold inventory at around $90 each. NumisDudeTX, can you give a more specific heads up on which AP’s are bailing out at around $90? Thx. On Friday I found 2 large dealerships with select bullion 5-oz coins at $90-$97. sdbullion.com (owned by 2 physicians) & Modern Coin Mart.